At my price, I don’t want to buy a 1 lakh plus designer replica lehenga. What choice do I have? Originals cost way above my price point. Do I have to resort to Chandni Chowk Lehenga stores, even in my budget? Do you know which designer stores come in my budget for a wedding lehenga? Sabyasachi, Manish Malhotra, Anita Dongre, Rimple & Harpreet, there are so many of them. But all of their wedding lehengas cost at least INR 3 Lakh+. Come to think about it, it is a frustrating place to be in. Even with a healthy budget, you are sort of out of options. A lot of brides these days are opting for retail store wedding lehengas. You can get heavier looking piece for much less than a designer tag. But alas, a designer lehenga is a designer lehenga after all. No Roopkala, Asiana, Frontier can give the same feeling, right? This might not look like a wedding lehenga, but can be worn as a reception piece, maybe? Invest in a lehenga that is more than a one time affair. Here’s a couple of things you need to keep in mind if you’re a mid to high budget bride. Designers put a lot of heart and soul to come up with unique designs. They spend months, sometimes years to come up with a collection. They travel far and wide looking for inspiration, spend time in researching their craft etc etc. So to overcome all those costs incurred, the price of the lehenga eventually goes up. Designers sell fewer than retail lehenga stores, so their margin has to be bigger. Retail lehenga stores sell in mass, so they can give those discounts that we all love. So all that said, where can one find Wedding Lehenga Under 1 Lakh? Truth be told, you won’t find a wedding lehenga under 1 lakh in any of the premium A-List designer store. You just can’t. May be a one off old stock piece might be available online, but in-store is next to impossible. So what should you do? Should you up your wedding lehenga budget? Or should you resort to buying a non-designer wedding lehenga instead? Well honestly, I don’t have a clear cut answer to either of the questions. But what I can do is share with you some designer labels with Wedding Lehenga Under 1 Lakh options. You may or may not go for it. But it’ll give you an idea of what you can get for your money. I am a big advocate for silk for bridal wear. Luckily pure banarasi silk is absolutely in vogue this year. There are a so many advantages of going with banarasi silk. You know the exact worth of a banarasi silk. Say for example, banarasi silk sarees typically cost from INR 15k to INR 50k. So paying INR 1 Lakh for a full flared banarasi silk lehenga is sort of right on price. May be a bit on the higher side, but still ok.
Banarasi silk always has a heirloom value to it. It will never go out of style. You can actually in the real sense reuse your banarasi wedding lehenga post wedding as well. Dupatta can be easily reused with kurtas. Lehenga skirt can be teamed with a simple white shirt, or crop top for a fusion look. The blouse can be used with a simple saree to give it a heavy look. P.S. Real Brides are totally going for silk bridal lehengas. We just don’t see enough of them on the internet. But really, these lehengas look really pretty in person! Most of the banarasi lehengas by Bageecha Banaras are in the under 1 Lakh price range. You should know that in store you will find way more options than what you see online and on Instagram. If you want to make one of these your wedding lehengas, I am sure the designers at Bageecha Banaras can help you with a customised piece. It’s worth trying out. If you like Banarasi lehengas, then I have a series of posts on Frugal2Fab that might interest you. Where to shop Banarasi Lehengas? Ritu Kumar is an old gold name in wedding fashion. Earlier before Sabyasachi and others took the wedding scene by storm, Ritu Kumar was one of the most sought after names in bridal fashion. The good thing is, the designer’s outfits are relevant to this date. Even global fashion influencer Diipa Khosla wore an exquisite Ritu Kumar for her haldi. Her haldi lehenga cost a whopping INR 4 Lakhs! But what you need to know is that Ritu Kumar also has a bunch of Wedding Lehenga Under 1 Lakh. 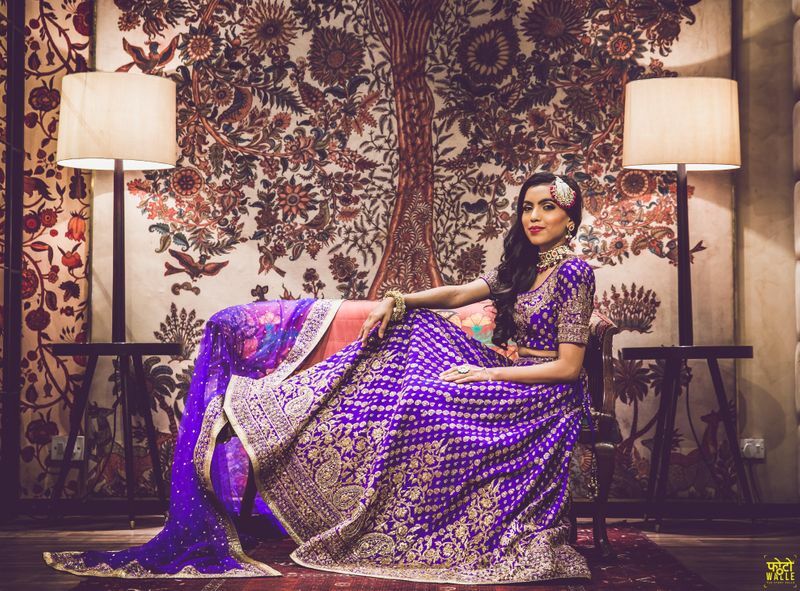 This lehenga was originally priced for INR 1.95 Lakhs and is now on 70% off! I have mentioned this Wedding Lehenga Under 1 Lakh in my earlier posts as well. The colour is so rich and will photograph beautifully. Plus, you get yourself a designer lehenga on budget! A real bride wore this same lehenga and this is how she looks. Click the link below to see her picture. If you like pastels, then this is a simple yet beautiful lehenga for your wedding ceremony. You can zoom in to see the details in the lehenga work. The idea behind sharing this is, know that you still have options. If you think a lehenga is looking too simple, then focus on accessories & jewellery. OTT lehengas are anyways out of fashion. Simple is the way to go. Ever since Priyanka Chopra’s red lehenga , somehow everyone seems to love the simple red for their wedding outfit. You can totally go for this last piece which looks somewhat similar to PeeCee’s wedding look. Red always looks good in pictures. Plus this lehenga comes with embroidery done all over it. So pretty decent for the price. Honestly, I haven’t felt this helpless writing a blog post as this one. This whole Wedding Lehenga Under 1 Lakh is such a painful search. Almost everyone is charging slightly more to much more for their outfits. Designer wedding lehengas that is. I really thought I could share at least 5-7 designers for you all to see. But turns out, the stuff is either way too pricey or not worth for the buck. Vandana Sethi on the other hand, I actually liked whatever I could gather. The lehenga prices online look pretty decent for the work on the outfit. The designer has a store in Shahpur Jat, Delhi. She keeps heavy bridal lehengas in the mid-affordable range of INR 50k to INR 1 Lakh. So in case you are wedding shopping in Delhi, will be worth checking her out. Full sleeves in embroidery work is in trends these days. They make the overall outfit look richer. Plus, if you have a non-toned arm problem, then this is an excellent way to flaunt and hide the flaws at the same time. If you are looking for traditional heavy bridal-bridal lehenga, than Vandana Sethi has a bunch of them in good price range. You can choose to add can-can to make the outfit look even richer than what it is. I wish I knew more designers to share in the search for Wedding Lehenga Under 1 Lakh. But this is all I could find. In case any of you’ll know of a good designer who does bridal lehengas under 1 Lakh comment and let me know.